Easy is my middle name! Everything that I’m making for Easter will be easy, especially since time snuck up on me once again. 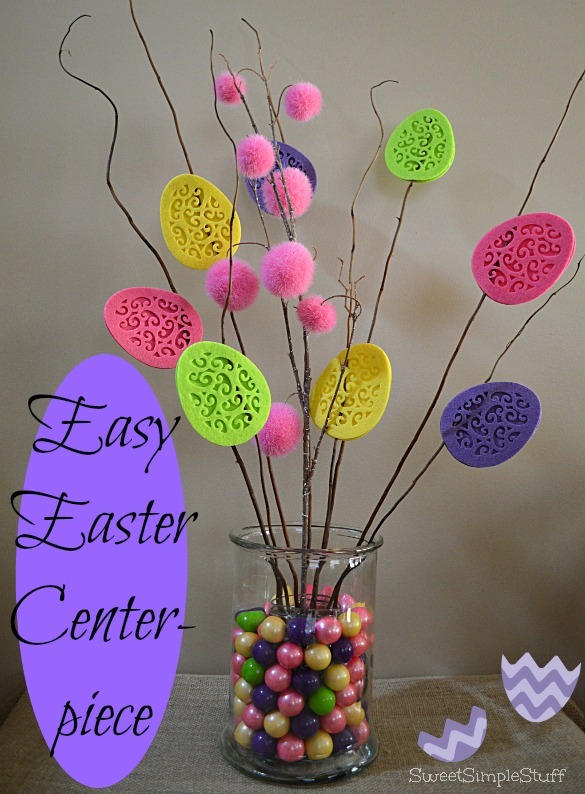 Today, I pulled out the glue gun … made this Easy Easter Centerpiece using the same pompoms and sticks from my Valentine’s Day Centerpiece. I really wanted a cylinder shaped vase or container … found one with a lid at Hobby Lobby and had a coupon, of course! 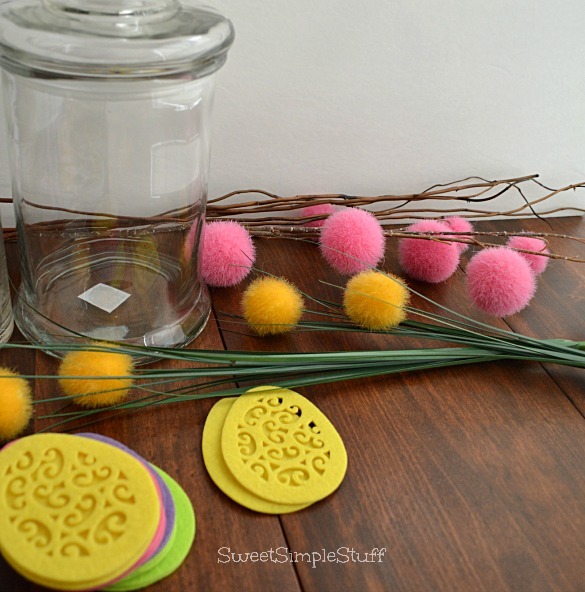 Then I found yellow pompoms at the 99¢ store, but ended up not using them … maybe next year. 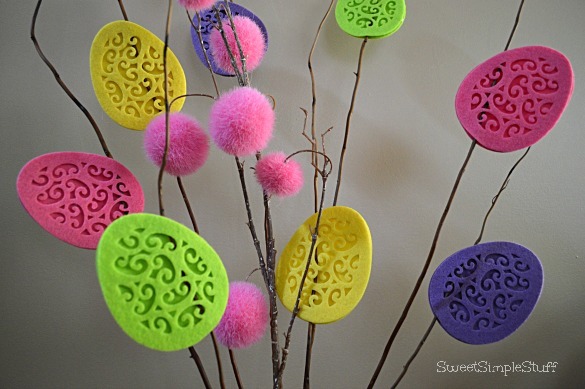 The eggs were in my stash from last year and are made from felt. I’ve seen similar ones at craft stores, some made from paper too! I was lucky that the colors of my eggs were the same colors as the gumballs I already had on hand. A mason jar worked perfect for arranging the gumballs. I filled the jar with marbles to help hold the sticks in place. 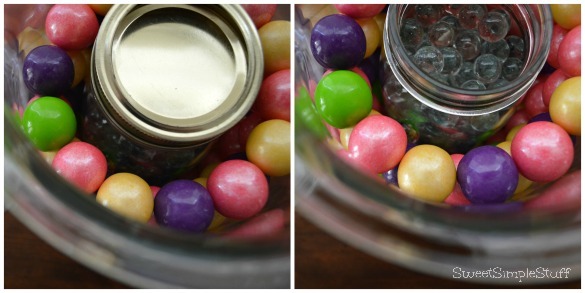 Helpful hint for the day … put a lid on the jar while you are adding the gumballs … I lived and learned … used tongs to fish out several runaway gumballs from the bottom of the empty jar. Also, fill the jar with marbles before you put it in the large container … I learned several lessons the difficult way! 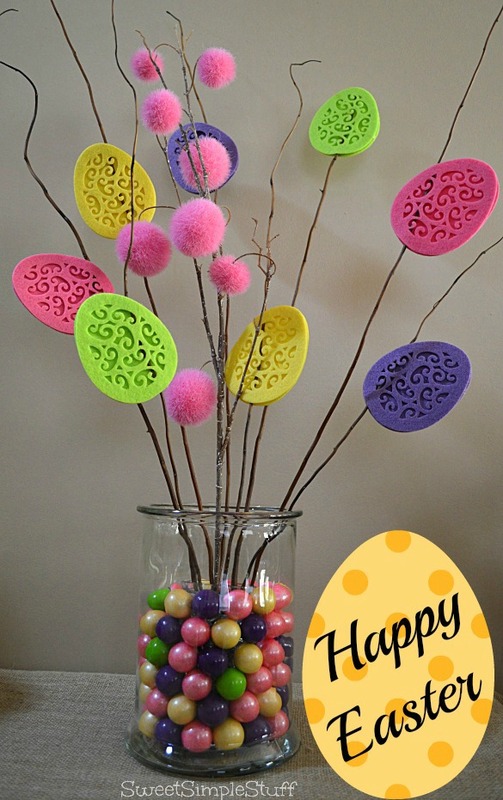 Attach the egg shapes around the sticks in the same manner that the hearts were attached. Using marbles was the answer for me to make the sticks stay in place … it only took me two days to figure that one out! I was trying everything that I could think of … remembered the bag of marbles that I use for real flower arrangements! Easy Peasy and yet so cute. I just can’t believe that Easter will be here before we know it. Where has the time gone? Hard to believe that March is almost over with. Thanks Colleen! I know what you mean … time flies! I made myself go into the attic and pull down a box of spring decorations … can’t even get to the boxes in the garage … that garage is a disaster!! !